Castlestone limestone alfresco pavers, bullnose capping and driveway pavers are manufactured locally from the highest grade WA limestone. Designed to perform especially well in Western Australia’s climate, limestone paving has the unique feature of remaining cool to walk or sit on, even on the hottest summer days. Each paver and bullnose is individually checked and finished by one of our master craftsmen. 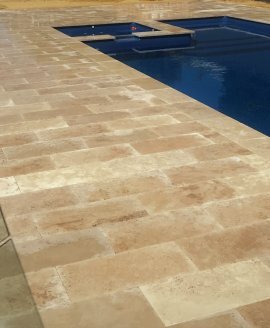 Selecting Castlestone limestone pavers, bullnose pool capping for your alfresco, pool and outdoor areas means they’ll be both stylish and functional, adding value to your home. The Castlestone difference is we enjoy helping you achieve your beautifully landscaped outdoor oasis. We provide all the relevant information to help you make an informed decision that’s right for your situation. We want you to sit back and relax after the project is complete and be thrilled with your choices. Well priced, high quality, beautiful limestone paving and bullnose capping is our focus and promise to you. Autumn is here so it’s time to consider upgrading or a freshen up of your outdoor space. These beautiful weather days create the best opportunity for a ‘staycation’ and with Castlestone Paving you can have a home to be proud of that’s perfect for parties. Come in and visit the friendly Castlestone team who offer style and design advice plus provide great value quotes for your bullnose headers and paving in cool limestone. We are also thrilled to announce the option of stunning natural stone with the addition of Travertine to our our range. Drop in or call today for a quote, you won’t be disappointed with the quality and value.